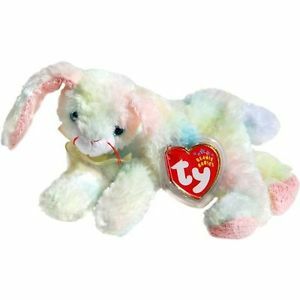 Cottonball is made from a fuzzy, multicoloured tie-dyed material with a white muzzle pale pink for the inside of her long, floppy ears and for her paw pads. She has blue and black button eyes and red thread whiskers and red stitching for her mouth. She has a tiny, white tail and wears a pale yellow ribbon tied around her neck. Is lying back to take a rest! Cottonball was released on 27th December 2001. Her birthday is on 30th August 2001. She retired on 8th April 2002.